I'm a long time fan of stuffing. Here at my house we eat it more often than Christmas and Thanksgiving. Way more often. Although up until a few years ago that wasn't so. One reason we eat it more is because I use it in recipes to make delicious and hearty meals. That and my little monkey loves it. So for those of you who just used your first or second package of stuffing this year you have been missing out. If you're making your own stuffing (and no one makes it like My Daddy does) a huge hurrah to you! But you may want to look into this for the rest of the year. 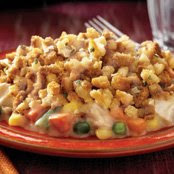 Tonight I am making the "Easy Chicken Bake" (Hearty Meals Section) with yet another package of stuffing. We're almost out again. Time for another trip to Costco. One of our favorites is to make the Meatloaf recipe from the site and use it for meatballs instead. I substitute Italian Salad dressing for the BBQ sauce often. So go ahead and check out the few recipes on Stove Top's site and then do your own searching and variations!